Let Solidarity Painting help you discover the true beauty of your home. 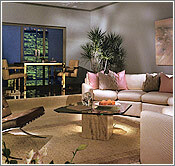 We can create just the right feeling with just the right colors to capture the essence of your surroundings. With a little help from Solidarity, it's very simple to create a uniquely personalized decor in your home. For example, blending tones is one of the secrets to a coordinating color scheme. By keeping your selections within one group of colors, you're assured of a harmonious scheme. Not sure what colors you want. Solidarity will apply sample colors first to aid you in your decision making process. That way, you can be assured of being happy with the end result.